To my knowledge this is one of the few models of this rocket launcher in small scale. The only other one I know to exist is from Schatton Modellbau which also offers a 1/72-scale model of the 21-cm Nebelwerfer 42, Kit 7229. 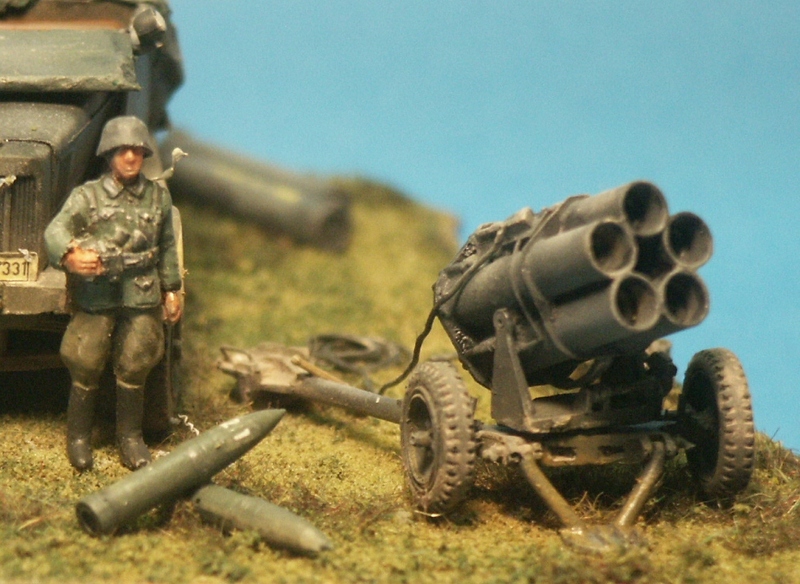 For a review of their similar Nebelwerfer 41 kit (7205) please see here. Nebelwerfer translates to smoke thrower, though its primary projectile was high explosive. In addition to being larger, having five tubes, and with a greater range than the 15-cm Nebelwerfer 41 (Ed. Note: which had six tubes), the rockets jet came out the base of the projectile rather than the mid-point of the rocket as on the Nebelwerfer 41. The 15-cm Nebelwerfer 41, the 21-cm Nebelwerfer 42 and other German rocket launchers were towed by the Sd.Kfz.10 1-ton and Sd.Kfz.11 3-ton halftrack tractors. The Attack model kit has about 15 cast resin parts for the launcher and an additional five resin rockets and five rocket storage tubes. The launcher is molded loaded with five rocket projectiles so it can’t be modeled in the towing mode (the launchers would not be towed loaded), unless you cover all that fine detail with a canvas cover used while the launcher is being towed. Plastic rod or wire for the handwheels we must supply ourselves. The exploded view instructions are reasonably clear but study your reference photos well. The biggest issue with the model is the need to saw the two sections of launcher tubes from the pore stubs and then to sand the mating surfaces smooth and not crooked. This photo shows the launcher in two sub-assemblies. Grab handles of brass wire have been super-glued to the rear of the trails. Like the ESCI kit of the Nebelwerfer 41, the electrical firing wires are missing so they have to be added by wrapping copper wire around the launcher. On the rear are small U-shaped wires that connect to the base of the rockets. Casting is very good. Like the 15-cm Nebelwerfer 41, the 21-cm Nebelwerfer 42 was based on the old Pak 36 anti-tank gun carriage. The Attack model is notably better detailed than the ESCI Nebelwerfer 41 kit. In the foreground is the pour-block holding the five rockets and the five ammunition storage tubes that come with the kit. The baseplate under the front of the gun is placed down, raising the wheels off the earth. Because of the large back blast and smoke given off by a salvo of rockets, these rockets were fired from a control at the end of a long wire. Behind the launcher is a coiled up (30-meter) wire made from fine solder wire and a scratchbuilt igniter device made from a small block of styrene with a T-shaped handle on top. In the foreground are two of the five separate 21-cm rockets supplied with the Attack kit. The rocket looks like a regular artillery shell with no fins; the rocket jet came out 22 orifices at the base angled to the axis of the rocket that spun the rocket to give it stability in flight. With the display set in the summer of 1942 the launcher is finished in a dark gray color, the tires in Poly-Scale Grimy Black color. The rockets are painted in a medium olive green. The launcher has no markings, though the canvas covers used during towing that I have seen carries a large number. At left is the nose of Special Hobby‘s 1/72 scale Sd.Kfz.11/4 Nebelkraftwagen 3-ton halftrack, a vehicle designed for towing the Nebelwerfers. From this view we see the finely detailed base of the rocket. The small box on the left side of the tubes holds the aiming device. 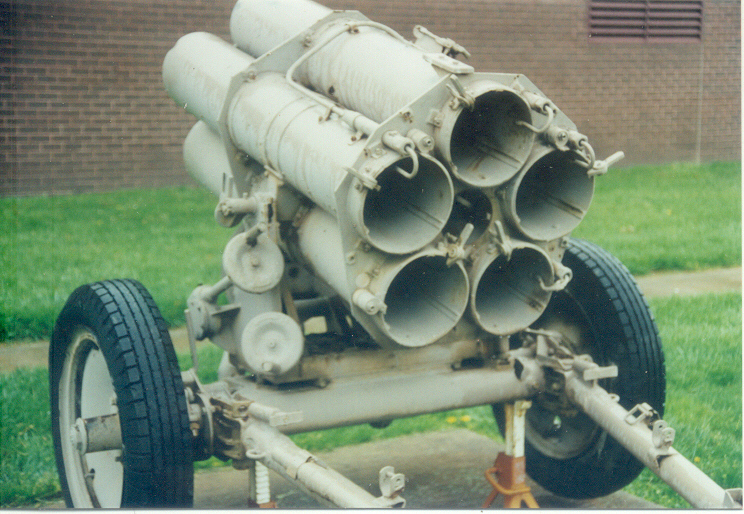 This and the photo below are of a 21-cm Nebelwerfer 42 on display at Aberdeen Proving Ground in Maryland, USA. 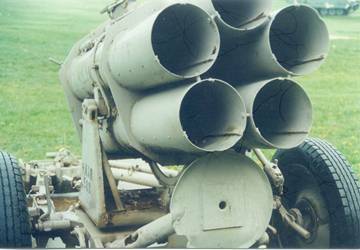 Notice the five tubes whereas the 15-cm Nebelwerfer 41 had six tubes. The support baseplate under the tubes is raised into the travel position. Notice the rails inside the tubes. The view of the rear shows the electrical wiring and contacts for igniting the rockets. At left are the elevation and traverse handwheels. This is also a good view of the Pak 36 anti tank gun carriage below the tubes. The metal box for the aiming device is missing. German Rocket Launchers in WW II, by Joachim Engerlmann, Schiffer Military History (1990). Inexpensive softcover book covering German Nebelwerfers, 48 pages.